I so wish I would've bought this chalkboard...but I missed out. Not that I need another chalkboard, but I have a problem...I'm not afraid to admit it. me too!!! i was so bummed when i saw they were all sold out. hopefully she will update soon. 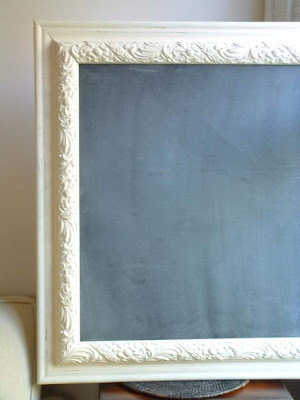 your blog has made me fall in love with chalkboards. Yet another item on my Must Have list. Ahhh! I can see why. This is beautiful. I love the frame on this, WOW! This looks like its from the Blue belle bazaar...i bought one from them and its real cute. Have it hung in my office.